I've been wearing the same things constantly over the past few weeks, I don't know what it is but I just can't help myself. I've found myself in a real style rut and I'm not sure how long it will last nor when I'll snap out of it so in the meantime, there'll be a lot of same-y outfits. 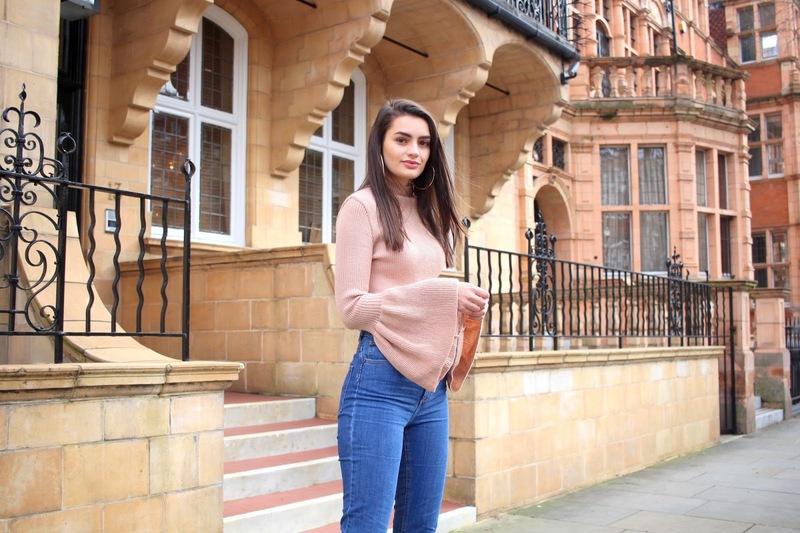 I can't believe this is the first time this blush pink bell sleeved top makes it onto my blog. Sometimes I share items I love on Instagram and forget that they haven't yet made an appearance on here so as soon as I realised I had to rectify that. 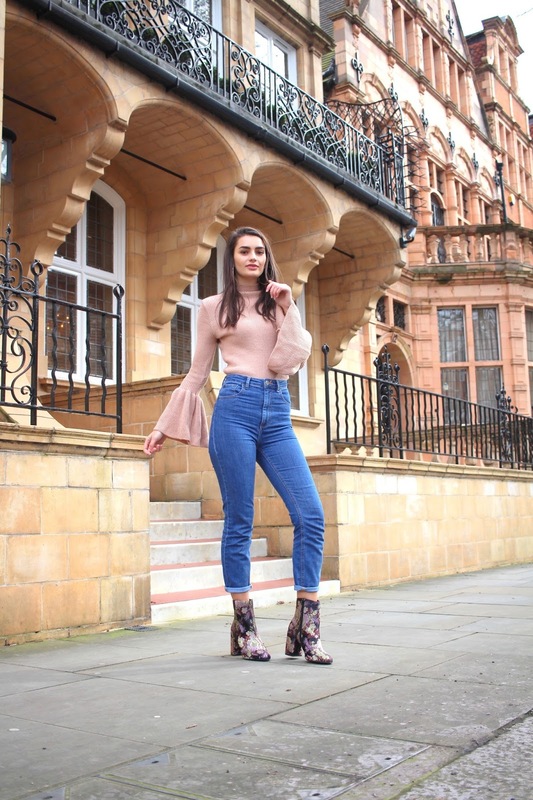 I didn't even try to style it any differently to how I have in the past; I simply tucked my top in to high waisted mom jeans (the ASOS farleigh jeans, duh) and picked out a pair of ankle boots, this time going for a new embroidered pair from New Look. 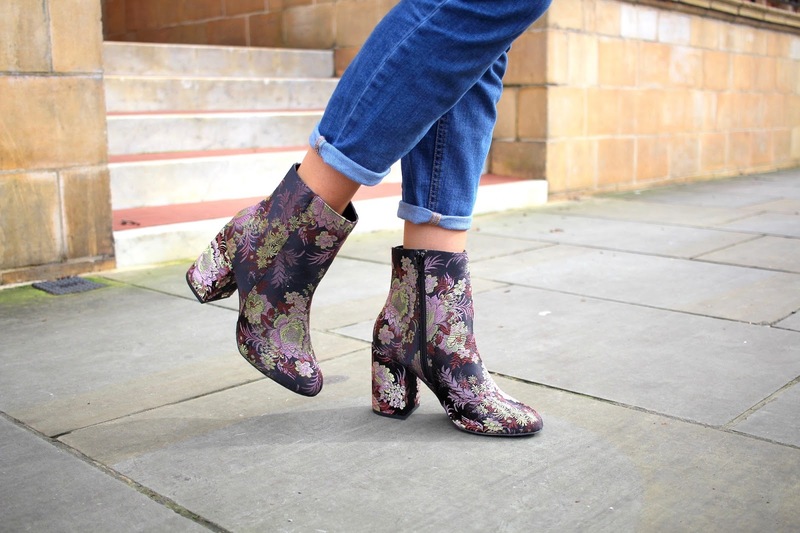 Because of my blog and the nature of what I do online, I feel like I always need to be wearing new things like the hottest new trend and ensuring items are new-season and in-stock so that if you want to buy something you can. 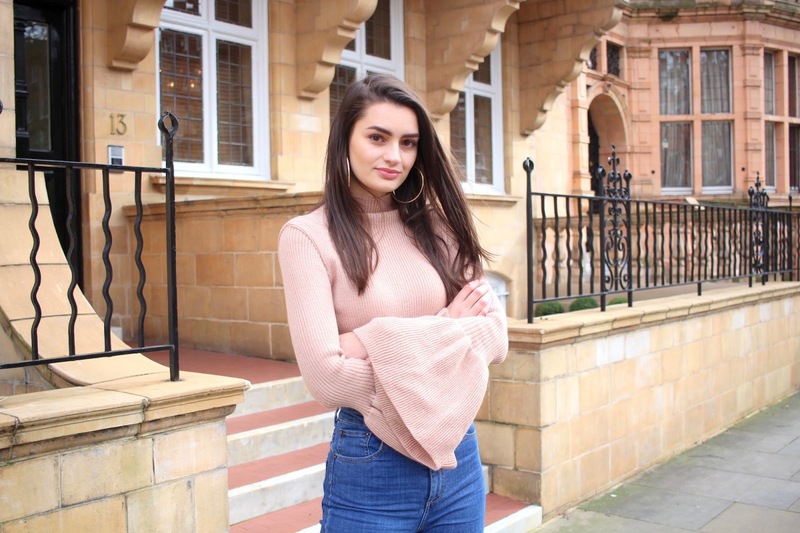 However, following on from my post last week where I talked about sharing items that are sold out, a lot of you actually said you don't mind not being able to buy the exact items I'm wearing and that my blog serves more so as a platform to inspire you which was amazing to read so thank you so much if you took the time to comment but not only that, it's made me think less about what I should be buying and more about my own personal style. With that said, I've been wearing the same things over and over and over and quite frankly, I'm bored of it. 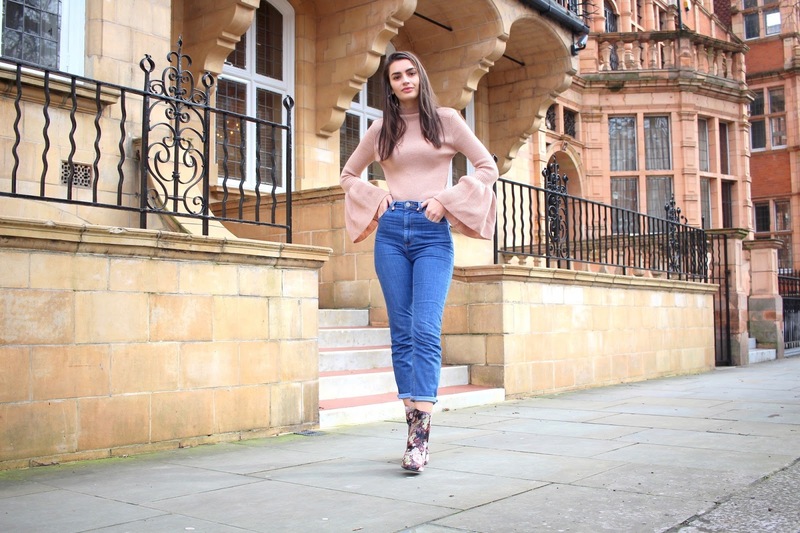 Mom jeans are a classic in my wardrobe, I wear them so much and whilst I've actively been trying not to wear them as much, opting for skinny jeans at times, I'm still pretty stuck on the whole denim thing. I want to try and rid myself of wearing so much denim (although don't hold me to that, it's still quite cold for anything else!) We're finally in the month of spring and I'm anxiously waiting for it to arrive, I'm hoping the sunshine and warmer weather will re-inspire me and absolve my current style rut. Any tips on how to beat a style rut are more than welcomed! Step 1 for me has been to add colour back into my wardrobe, see how I've been getting on over on Instagram: @peexo. You look AMAZING! 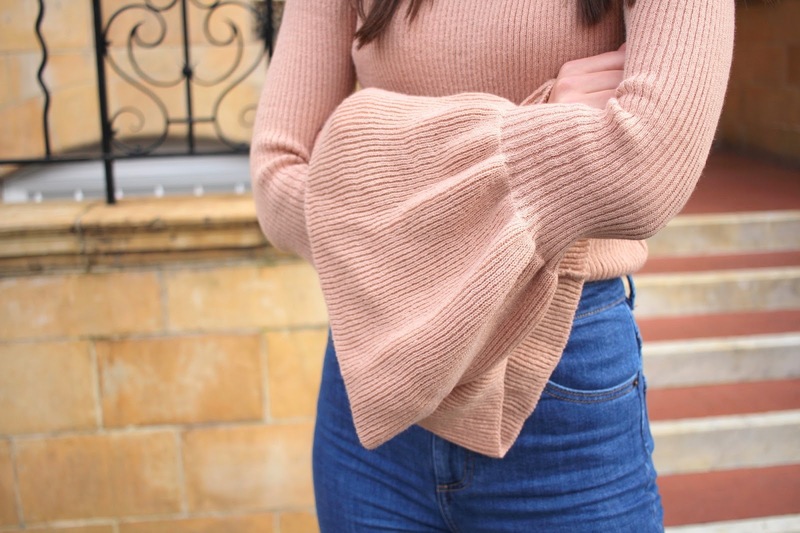 I am such a fan of a bell sleeve & you have paired it perfectly. Ugh them boots are beautiful! I'd love to see how you style different dress as I've mainly seen you in jeans really. Would love to see what you come up with for spring!